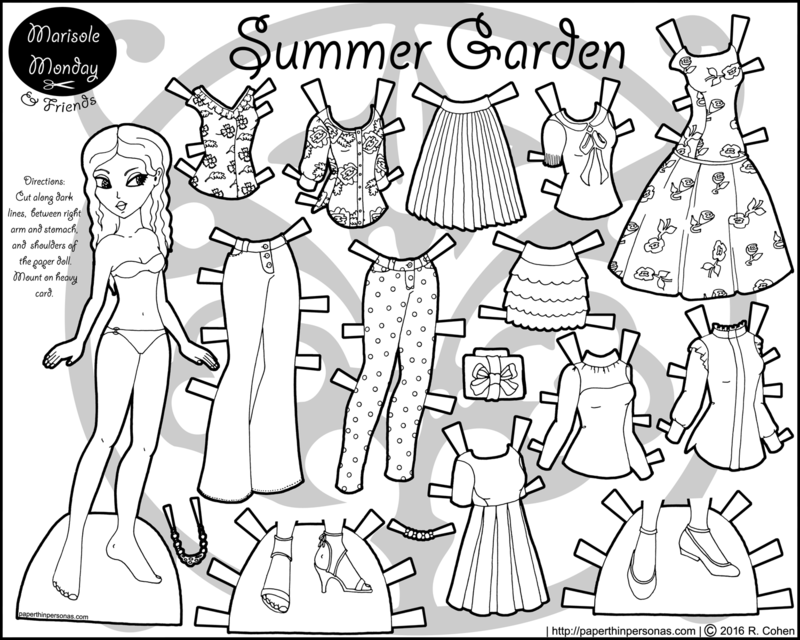 Normally, I try not to post two fashion paper doll sets in a row, but somehow my life just didn’t let me finish up the other sets I had hoped to have done. Sometime’s life is like that, so for today’s paper doll dress up, you’ll just have to live with another contemporary fashion set. A lot of these pieces are based on things from fashion magazines. I will openly confess that I really don’t remember everything I was thinking when I designed this set, except that I really wanted to play with pattern. See? Not very set has a deep philosophical story behind it. I’m not sure exactly what season this clothing would really work for. I mean, the turtlenecks are much more autumnal, but the florals are certainly a summer thing. I gave it the title Summer Garden, so I guess it’s summery? A friendly reminder that if you like the blog and you’d like to support it, I do have a Patreon page where you can donate to keep things around here up and running. It’s also home to the Vivian Project. I’m also pleased to show off my draft version of my new paper doll index page. It’s still being tweaked, so I’d love to hear what people think of it as well. Impressive Index! I love the drop waisted floral dress. I’m looking forward to the color version. Love the index page! Very cool to be able to look at all the historical ones you’ve done or even all the winter ones, etc. I’m mostly interesting in Marisole & friends. You mention their names sometimes when you post them. I get confused, however, at who is Marisole and who is a friend. I was wondering if you could do a post some time introducing each by name? Is that a possibility? Yes, that’s probably a doable post. Really the names are just a way for me to identify the different faces. It’s not as though they have personalities or anything in my head. I really like the dress and the pleated skirt. The index is quite amazing and vary useful I’m shore! The index is great. I can’t imagine how long that took! And the doll is nice, too. It feels like spring here in New England today (60 degrees! In February!) and this seems appropriate. The index looks amazing! What a job that must have been! I used to have a pair of polka-dot jeans, and a shirt very much like the one with the high neck and ruffled sleeve caps. Love the set! Thank you! over 600 pages. holy cow. that is so impressive. you are amazing! and i love the Garden fashions ~ unimaginatively, i’m thinking they are yelow and green.